Like, totally grody fer sure! The girls have been dressing up all week for Spirit Week at their school. They’ve had “comfy cozy” day where they got to go in their PJ’s, “Crazy Day” where anything goes, and “College Day” when most of the school wore either purple or red. 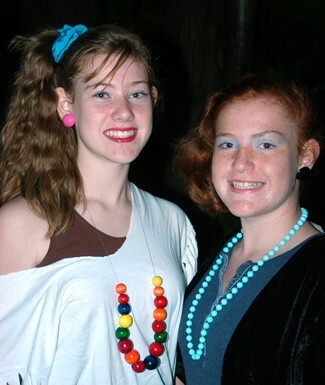 Today seems to be the most exciting for the girls…it’s “80’s Day”. Somehow I ended up ripping an old t-shirt up into something out of Flashdancing (not that my kids know what that is) I had to draw the line at ripping up the soccer socks to make them look like leg-warmers though. We settled for layered socks. I had to braid hair so that in the morning, they would have that “crimped” look. It didn’t matter to them when I explained that I spend nearly an hour every morning with my hot rollers to get the perfect “big hair” and rarely ever had a side pony tail. KT was the expert and knew exactly how it was back then! Finally they had their looks down just how they wanted them. KT was like, totally into it. Mimi was mostly into the hair and lots of blue eye makeup. (she never gets to wear make up, so she takes every opportunity she can to use it) I had fun decorating lunch sacks with Valley Girl expressions. I hope they have like a totally radical day. Don’t they look, like totally AWESOME! This entry was posted in KT, Mimi, Random stuff. Bookmark the permalink. 16 Responses to Like, totally grody fer sure! WOW, they both sure look great…I always had a side ponytail in the 80’s, it’s quite scary how cool they’re considered now! That’s like totally awesome! I bet this whole week has been a blast at that school. 80’s day – What happened to 50’s days??? BTW – the girls got the look pretty good. I still have a pair of white stilettos somewhere and some really big earings. Very convincing, I must say! Hey! Who said they could wear MAKE-UP!?!? Ok, like gag me with a spoon, like they like look, like soooo cool, yeah know. Like, ok, they like totally got the look. Like SO Madonna and like so like Cindy Lauper. I mean, like totally cool man. We had Spirit Week at my school this week too. Our days were not as much fun. We did have a Retro Day, but the students did not get into it much. I wore a long hippie-looking skirt and my “War is Not Healthy for Children and other Living Things” medallion. But my students are not surprised by or even interested in what I wear. Your girls look “Excellent”, what fun. Even if there were no side-pony-tails in the 80’s, there should have been. Look how fashionable the big-hair pony-tails look on your daughters. They’re adorable…I missed out on the 80’s look – corporate life in the big city didn’t allow the cool look. The entire week sounds like it was great. WOW! Way to go, KT. That is the ultimate 80’s look. I feel so old. But I had great hair in the 80s! That wavy big hair was a natural for me. Spoon? Dude, like gag me with an entire place setting. Those outfits are like, totally excellent. I feel so old. I graduated from college in the eighties. Thanks for the ideas! I am taking the whole family to the Regeneration Tour this summer 08. Dead or Alive, ABC, Naked Eyes, Human Leeague, Belinda Carlisle will be playing. My girls, 10 and 8 will be dressing the part. I was looking for some “cheap” ideas. Tell your daughter she did a great job!